Update: Please follow this guide to check whether your Galaxy Note 7 battery is safe or not. If the battery is not safe, you should return/exchange it as early as possible. Do you need to charge Galaxy Note 7 battery for 8 hours first time? First, you should charge Galaxy Note 7 battery before you use it extensively. But, it is NOT necessary to charge it for 8 hours. Once the battery is fully charged, it is safe to disconnect the charge and use your Galaxy Note 7. It is also OK to test your Galaxy Note 7 when you are purchasing the phone. In some regions, Samsung does not offer one-to-one exchange. If you failed to detect the problems on the spot, you will have to visit Samsung service center to repair you Galaxy Note 7. The bottom line is you should charge Galaxy Note 7 battery after you get the phone. And you need to wait until it is fully charged, not 8 hours. In your daily use, it is also recommended to unplug the charger once Galaxy Note 7 is fully charged. Leaving a fully-charged Galaxy Note 7 on the charger will not benefit the battery life. But there are no solid evidences to show any possible harms from the tricking current if you leave the phone on the charger. It is simply not necessary to leave it on the charger. Of course, it is not necessary to wake up to unplug the charger in the night. There are many different ways to charge Galaxy Note 7 battery, although in your Galaxy Note 7 box, there is only a fast wall charger. the bundled fast wall charger. It should take you less than 2 hours to charge Galaxy Note 7 battery from 0-100%. If it takes more than 3 hours, something wrong with the cable or charger or the USB port in Galaxy Note 7.
your old normal wall charger. You can use most old USB charger (suppose you can use the new USB type-C cable for these chargers). Most old Samsung chargers still work with Galaxy Note 7. But you have to use a new USB Type C cable, or use the USB Type C adapter (you can find one in your Galaxy Note 7 box). The charging time depends on the power output of your old charger. a wireless charger. You can get a normal wireless charger to charge Galaxy Note 7 without using the USB cable. Please note. most wireless chargers do not bundle a wall charger. You have to make sure you have the wall charger for the wireless charger. It usually takes 3-4 hours to fully charge Galaxy Note 7 battery with normal wireless charger. If you use a thick phone case/cover, it can take even longer. a fast wireless charger. Fast wireless charger can reduce the charging time about 50% compared to normal wireless charger. The charging time for Galaxy Note 7 is about 2 hours. your PC. You can use your PC to charge Galaxy Note 7 battery. But it is very slow. How do I know Galaxy Note 7 battery is fully charged? Once the battery is fully charged, in the lock screen, it should shows “charged”, instead of “charging”. 100% is different from fully charged. You can also check charging status in Settings— device maintenance —battery. In addition, by default, the color of indicator LED will tell you charging status. If it is red, it means it is still charging. Blue/green means fully charged. But the LED color can be spoiled by notifications sometimes. Wireless charger usually has its own indicator on charging status. For example, for Samsung branded wireless chargers (including fast wireless chargers), the blue color ring means it is charging and green means not charging (and the phone is fully charged). How to use wall charger to charge Galaxy Note 7 battery? To use a wall charger to charge Galaxy Note 7, you may follow these steps. Step 1: Connect the USB cable one end (bigger end) to the charger. Step 2: Connect the other (smaller) end of USB cable to Galaxy Note 7 as shown below. As Galaxy Note 7 uses USB type-C port, you cannot use the micro USB cable. You should use the bundled USB Type-C cable (type-A to type-C). For USB Type-C cables, the end is symmetric. So, the direction (up-down) is not important. Step 3: Plug the wall charger into an electric socket. Step 4: Unplug the wall charger from the wall socket and remove the USB cable from Galaxy Note 7 once Galaxy Note 7 battery is fully charged. How to use wireless charger to charge Galaxy Note 7 battery? There are two types of wireless charger, normal one (like this one), and fast wireless charger (like this one). But the usage is identical. Fast wireless charger can work in two modes: normal wireless charging with an output current about 1000mA, and fast wireless charging mode with an output current at about 1500mA. The output current is controlled by Galaxy Note 7. Some wireless charger has a stand design and some may have a flat design. This does not affect usage. To use wireless charger to charge Galaxy Note 7 battery, you may follow these steps. Step 1: Power on wireless charger. Most wireless chargers include a charging pad and a power adapter (USB charger). You need to connect the charging pad to the adapter with USB cable provided. If the wireless charger is bought as a charging pad only, you should connect the charging pad to a fast (adaptive) wall charger, not normal wall charger, with a proper USB cable (usually a micro USB cable). Once the charging pad is connected to the wall charger (adapter), you can power on the adapter. 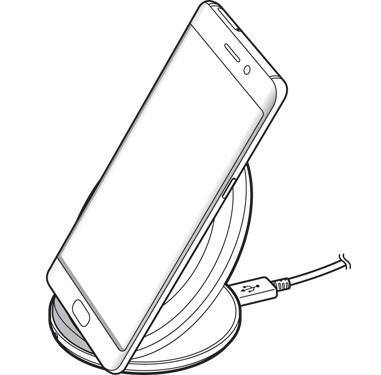 Step 2: Place Galaxy Note 7 back on the center of the wireless charger. You should try to place the center of Galaxy Note 7 to the center of the charging pad as shown below. You can refer to Galaxy Note 7 layout to find out the rough location of the wireless charging coil. Misalignment or a thick case/cover may slow down the charging significantly. Normally, the charging pad will display a color to indicate that charging Galaxy Note 7 battery is in progress. For Samsung wireless chargers, the color is blue. Step 3: Wait till Galaxy Note 7 is fully charged. When Galaxy Note 7 battery is fully charged, the wireless charging pad usually changes the LED color, for example, for Samsung wireless charging pad, green color indicates Galaxy Note 7 battery is fully charged. Of course, the color of the indicator LED on Galaxy Note 7 should tell you the same story. If you are using a fast wireless charger to charge Galaxy Note 7, do not block vents (many small holes) near the bottom of the charging pad. Step 4: Remove Galaxy note 7 from wireless charging pad. It is safe to leave Galaxy Note 7 on the charging pad because wireless charger will cut off current supply to the phone when Galaxy Note 7 battery is fully charged. This is one of the advantages of wireless charging against wall chargers. 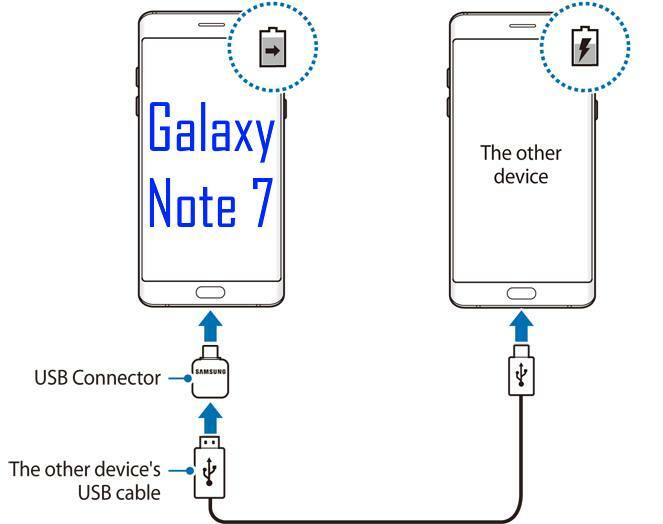 How to use a micro USB cable to charge Galaxy Note 7 battery? USB Type-C is still new. Most smartphones are still use micro USB cables. So, it is not uncommon that you may find sometimes, you can access micro USB cable only. In your Galaxy Note 7 box, Samsung offered you two connectors: one USB connector (the big one) and one micro USB connector (the small one) for you to solve this issue. You can connect micro USB cable to the micro USB connector, then plug the micro USB connector into Galaxy Note 7 as shown below. Never insert micro USB cable to Galaxy Note 7 USB port directly. You may damage the port (and the repair is not cheap). How to charge other devices with Galaxy Note 7 battery? You can use Galaxy Note 7 battery to charge other devices, thanks to the USB Type-C implementation. Remember this will drain your Galaxy Note 7 battery, not charge your Galaxy Note 7 battery. To charge other devices with Galaxy Note 7 battery, you have to use the USB connector (the big one, not the small one). As shown below, insert the USB connector to Galaxy Note 7, then plug the big end of USB cable to the USB connector. And finally connect the other end (usually micro USB) to the device. 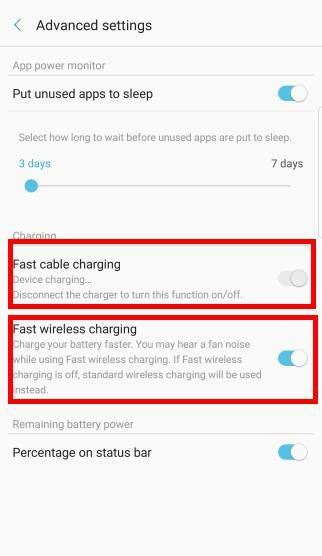 How to disable fast charging or fast wireless charging on Galaxy Note 7? It is NOT necessary to disable fast charging or fast wireless charging. They will not have any significant impact on Galaxy Note 7 battery life. But if you insist, you can disable fast charging and fast wireless charging in Settings— device maintenance —battery — Menu button (3 vertical dots) — Advanced settings– Fast cable charging (and fast wireless charging) as shown below. Again, it does not make much sense to disable fast charging or fast wireless charging in Galaxy Note 7. The device should work for you, not the other way around. How to check Galaxy Note 7 battery usage? You may “feel” your Galaxy Note 7 battery life is not up to your expectation. This is normal. In the reality, most Galaxy Note 7 owners can get about 2.5-6 hours screen-on time depending on usage and settings. In other words, some Galaxy Note 7 owners may get more than twice screen-on time than others. If you want to check battery usage in Galaxy Note 7, you may go to Settings— device maintenance —battery — battery usage as shown above. You may refer to this guide on how to read Android battery usage. 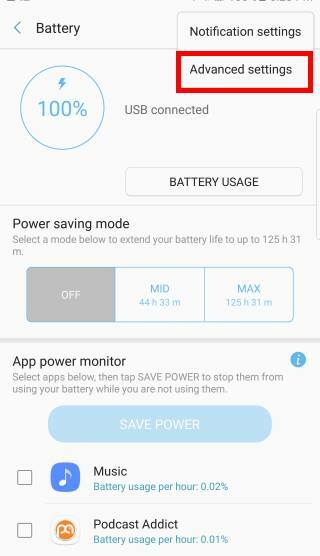 How to save battery in Galaxy Note 7? You should enjoy Galaxy Note 7 and your Galaxy Note 7 should work for you. Don’t be the slave of your gadgets. No matter how you use Galaxy Note 7, Galaxy Note 7 battery degrades significantly after 1.5 to 3 years. For normal usage (e.g., charging daily or less frequently), Galaxy Note 7 battery will lose about 20%-50% battery capacity after about 2-3 years. Heavy users (e.g., charging twice daily or more frequently) may see a similar drop after 1.5-2 years. So, it is important to set your expectation correctly. You may consider to change the battery after 12-24 months if you plan to use Galaxy Note 7 for more than 3 years. Of course, saving battery may help protect our environment. Using device maintenance in Galaxy Note 7 to optimize the battery usage. Turning off the screen by pressing the power key, when you are not using your Galaxy Note 7. Activating power saving mode if you intend to extend battery life for specific period. Power saving mode will decrease the performance of your Galaxy Note 7. It is not designed for daily use. Closing unnecessary apps. Android Marshmallow can do an excellent job. But you can also try to clear the recent app list if you often exit apps with Home key. Deactivating the Bluetooth if you are not going to use it for next 3 or more hours..
Deactivating the Wi-Fi if you are not going to use Wi-Fi for next 1 or more hours. Deactivating auto-syncing of apps that need to be synced, such as emails. You can choose to sync them manually. Again, this is not designed for daily use. Decreasing the screen brightness. You should make sure you are comfortable with the brightness. Do you have any questions on charging Galaxy Note 7 battery? If you have any questions on Galaxy Note 7 battery, please let us know in the comment box below. I was told the Note 7 was okay to be left in the wall charging over night and it would not affect the battery, unlike other phones where it suggests only charging it for as long as necessary. Is it true that this phone has a smart technology to know when to stop with out harming the battery? First, you should know there is a global (except China) recall of Galaxy Note 7 due to battery quality issues. You should try not to use your Note 7 if possible. If you have to use Galaxy Note 7 before you can replace or return it, you should not leave Galaxy Note 7 unattended when charging. You should disconnect the charger once Galaxy Note 7 is fully charged. Of course, this is due to special situation of faulty Galaxy Note 7 battery. For normal smartphones, the battery have its own protection mechanism. it will not be overcharged or overheat. Once battery is full, only trickling current is delivered from charger to the phone (because phone cannot power off charger). So, it is safe for all phones without battery issues.